For enquiries and/or bookings please contact Barry Chislett by using the form below. Or feel free to use the telephone number. ‘Suilven’ is situated in the little crofting village of Rhue 3 miles north of Ullapool, a left-turn off the A835. It is the first house on the right as you come into the village. 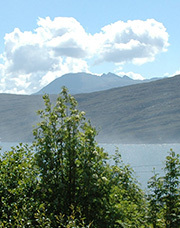 Ullapool itself is a 1 1/2 hours drive from Inverness airport where cars can be hired. Alternatively buses connect twice a day from Inverness to Ullapool as the main port for the car ferry to Stornoway and the Outer Hebrides.